Antony Flew: 3 Factors from Science that point to God are Nature obeys laws, Intelligently organized purpose-beings and the existence of nature!! During the 1990′s I actually made it a practice to write famous atheists and scientists that were mentioned by Adrian Rogers and Francis Schaeffer and challenge them with the evidence for the Bible’s historicity and the claims of the gospel. Usually I would send them a cassette tape of Adrian Rogers’ messages “6 reasons I know the Bible is True,” “The Final Judgement,” “Who is Jesus?” and the message by Bill Elliff, “How to get a pure heart.” I would also send them printed material from the works of Francis Schaeffer and a personal apologetic letter from me addressing some of the issues in their work. My second cassette tape that I sent to both Antony Flew and George Wald was Adrian Rogers’ sermon on evolution. 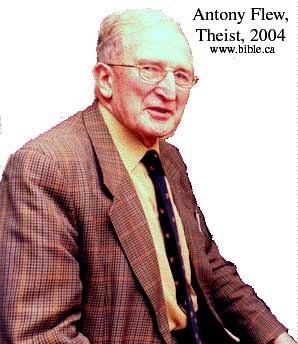 Antony Flew — Still with his head in the game! A friend of mine and I have been reading Antony Flew’s new book THERE IS A GOD. Flew had been the English-speaking world’s most prominent atheist until Richard Dawkins assumed that role. A few years ago, Flew announced his conversion to theism (though not full-blown Christianity). This caused a stir at the time, but true to their materialist bias, the academy and media quickly fluffed it off (“poor Antony — he’s just getting old and a bit soft in the head”). As the following excerpts (that my friend collected) attest, Flew knew exactly what he was doing in rejecting his lifelong commitment to atheism. Also, a refreshing feature of the book is Flew’s evident grace, good will, and sensitivity — the contrast with the boorishness of neo-atheists like Dawkins-Hitchens-Harris is stark. the dial pad and hear different voices upon hitting certain sequences. exact replica and hit the numbers again. They hear the voices again. the table, to set out my own views and the reasons that support them. life and reproduction originate in a divine Source. Three domains of scientific enquiry have been especially important for me, and I will consider them as we proceed in the light of today’s evidence. The first is the question that puzzled and continues to puzzle most reflective scientists: How did the laws of nature come to be? The second is evident to all. How did life as a phenomenon originate from nonlife? And the third is the problem that the philosophers handed over to the cosmologists: How did the universe, by which we mean all that is physical, come into existence?